Bigmeal brings you healthy, nutritious & affordable Ready to eat Breakfast items that reminds mother's touch home cooked foods. It's the fuel that charges you up and keeps you pepped up for the day ahed. 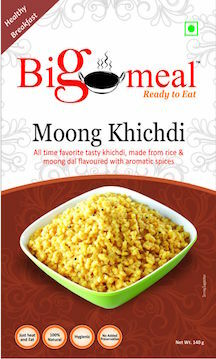 Light up your boring mornings with Bigmeal Ready to Eat Moong Khichdi at Home, office, Hostel, Camping, Trekking, Tours and Travels.